Truly successful artists are those who elicit an emotional response in their audience. It is no different with writers. When a writer can make us react in some way to their words, make us laugh or cry, they have achieved something wonderful. YA novel, Letters to Leonardo, by Dee White (Walker Books 2009) is certainly something wonderful. It grabbed my emotions from the start. Main character, Matt Hudson, is having his fifteenth birthday. All he wants is art lessons, but what he gets is a book about motor bikes and a card from the mother he thought had been killed in a car accident when he was five. Matt has a strong voice: we read his anger, his wry self-deprecation, sarcasm and confusion, and look out at his world through fifteen-year-old eyes. With Matt, we "go from hyped to gutted in a blink." It's obvious White has grounded her novel in experience of teenage boys. Her characters are so believable it's as if Matt and his mate, Troy, have jostled their way through my front door, hooked chairs with their feet and are sprawling here, all gauche and gangle, chatting to me. As we join Matt in his search for his mother, we become aware of imperfections in the world of adults. Like Matt, we learn that things are not always what they seem, that we need to look beneath the surface - of people, of paintings, of life - to gain understanding. White seamlessly weaves narrative with the letters Matt writes to his hero, Leonardo da Vinci. Matt finds an outlet for his internal chaos and confusion in the form of his admiration and fellow-feeling for Leonardo. There's lots of drama and tension in this novel, but also some lovely moments of humour. I loved reading of the local police officer and the garlic that "oozes out of his skin like invisible sap." I was totally involved in the story - so much so that when I finished it, I had to heave a huge sigh, mop some tears and loosen my tight shoulders. Teens who enjoy drama, true-to-life problems and characters so real you want to hang out with them would love this book. It would make a great choice if you're looking for a novel to stimulate thought and discussion. Young people learn empathy for others by walking a mile in someone else's shoes. In Letters to Leonardo, they can do just that. You can find out more about Letters to Leonardo here at The Book Chook, including a great literacy activity from author Dee White herself. Or check out Stories are Light where Sandy Fussell interviewed both Dee, and her main character, Matt. 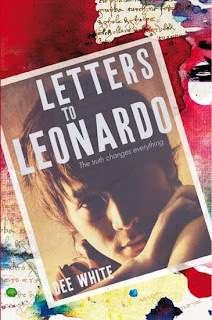 http://bit.ly/cGmuqa Latest post: Book Review, Letters to Leonardo. Excellent YA book with confrontin<wbr></wbr>g themes handled beautifull<wbr></wbr>y. Sounds like a great book for parents to read with their teenagers. I love the Leonardo da Vinci link. Thanks, Susan! It would make a great book to share with teens, Dawn. I think it would bring up interesting points about honesty between family members and why people sometimes believe lies are necessary. An excellent one for schools too. thanks to you for posting this great review very useful and interesting post.